2018 experienced an explosion of Serverless conferences and events. The interest was unbelievable which is unsurprising given how rapidly serverless adoption has grown. As businesses continue to move their architectures from monolith to microservices, we can see from all the conferences that these organizations are really looking at serverless computing as a serious option for their microservices applications. Now that we left 2018 behind us, it’s time to look forward! There are plenty of events planned throughout the year and around the world. You may have some questions, of course. For example, which event is best for me? Is there any event nearby? Or, which events will feature my favorite speakers? We did a bit of research to address your questions and make it easy for you to sift through the noise. Let’s take a closer look at your 2019 options! Grab your coffee, and get your calendar ready. No doubt that AWS re:Invent 2019 will be a remarkable event. Just picture a thousand innovative sessions, keynotes, workshops, builders sessions, hackathons, parties, etc. This is exactly the flow of re:Invent each year. Thundra was a Bronze sponsor in 2018. We had a chance to meet many people who stopped by our booth and shared their experiences and needs. Both Thundra and AWS made important serverless-related announcements during re:Invent week, including one major announcement that Thundra and AWS made together. You can find more details on our AWS recap blog. We will be attending AWS re:Invent 2019 and in fact, we are already excited about it. However, as it is scheduled at the end of the year, speakers are yet to be announced. Serverless Days are group of events that take place in different locations around the world aiming to bring the serverless community together. Each ServerlessDay event is organized by locals and they announce the speakers at a different time depending on the event date. Thundra is planning on participating in at least some of these events. Enjoy these 1-day events while contributing to your network and knowledge. Hope to see you there! You can find more information about the upcoming Serverless Days events from here. Dates & Locations: Throughout the year, all around the world. O’Reilly is hosting many conferences in different concepts. I’m gonna focus mainly on “O’Reilly Software Architecture” and “O’Reilly Velocity” as the notion is around “engineering the future of software”, and “building systems that drive business”. The leading software architects and practitioners will be teaching new skills, approaches, and technologies for building and managing large-scale, cloud-native systems. They will be helping you to shape the skills you need to keep up with the trends and techniques. The topics in both conferences vary from serverless, microservices architectures, monitoring, and observability to chaos engineering. Only the speakers of New York O’Reilly Software Architecture are announced so far and featured speakers are: John Chapin, Gregor Hohpe, Neal Ford, Maria Gomez, Allen Holub, Matt Stine, Ruth Malan. The outstanding cloud experts and software architects are coming together to share and transfer their knowledge and opinions. Topics include Serverless platforms and technology, Cloud Services BaaS, Docker, Kubernetes, and containers. Some of the speakers of Serverless Architecture Conference are Marcia Villalba (Rovio), Ory Segal (PureSec), Nikhil Barthwal (Google), Soenke Ruempler (superluminar GmbH). Focusing on Microservices & Serverless technologies, microXchg is a community conference in Berlin, Germany. The speakers are going to transfer their knowledge & patterns as well as sharing their failures and experiences in many areas including Microservices Architecture, Serverless Solutions, Observability, and testing. If you would like to build the skills around these topics, then you should book a flight to Berlin. Gluecon is getting ready for its 11th annual conference. This “developer-oriented” conference’s topic range is pretty wide including serverless and containers, and everyone can find the unique topic they would like to dive deep into. You’ll also get a chance to learn the newest tools and platforms driving technology. They are currently looking for deeply technical talks in areas like DevOps, Microservices, Containers, and more. The best part is that you can also apply to be a speaker if you believe you are ready to speak about a topic you have. Eric Norlin, Co-founder of Gluecon joined by his wife Kim Norlin who is managing processes at Gluecon, mention that first-time speakers are welcomed! To sum up, if you’re into learning rather than after parties, or superficial talks and sessions, then this conference is right for you. If you are interested in new technologies and trends, then you should definitely be considering one of the QCon events in 2019. QCon is a place where developers can meet and share their experiences, thus helping software development as a whole. There will be 3 conferences and workshops this year: QCon London , QCon.ai in San Francisco, QCon Newyork. As some of the larger gatherings of the tech community, the AWS Global Summits host members of the cloud community to connect, collaborate and share ideas. Moreover, it is that one place to be to learn everything about AWS where talks can range from choosing the right database to digital transformation using AI. Held in major cities around the world, throughout the year, the summits can be expected to attract technologists and industrialists with a potpourri of skills and knowledge. All these minds brought in one place together discover how to use AWS to their benefit for speedy innovations, flexible solutions and scalable implementations under the cover of reliability. Thundra will also be participating different AWS global summits as we believe sharing knowledge and experience is important. Check out the summits’ calendar here. Next ’19 is Google Cloud’s global exhibition. There are many things to learn and explore from the latest business trends to emerging technologies through immersive learning experiences. Basically, it’s for everyone who is passionate about innovation, education, and latest trends. You can find and pick your favorite session among more than 450 sessions. You can also meet with Google experts, connect with IT professionals and lead architectures in infrastructure, serverless and so much more. Therefore, it’s a great opportunity to contribute to your skills and network. Unlike Google and AWS, Microsoft doesn’t have a compact event to summon the Azure community into one place for a week. Instead, Microsoft runs smaller events all around the world throughout the year focusing on specific parts of their technology. 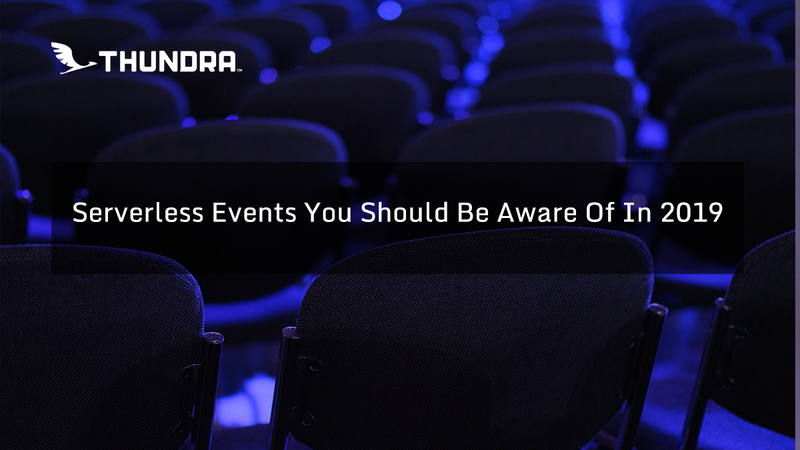 Check out all types of events all year with Azure. You can catch one and learn more about Azure approach for serverless. I sense that 2019 will be the year of Serverless. We, as Thundra, are proud of the improvements we made in this area and will keep doing our best in the industry. Thundra provides full monitoring and observability for both developers and operators of AWS Lambda environments. Pinpoint your serverless problems and get back to coding. Learn more at thundra.io.